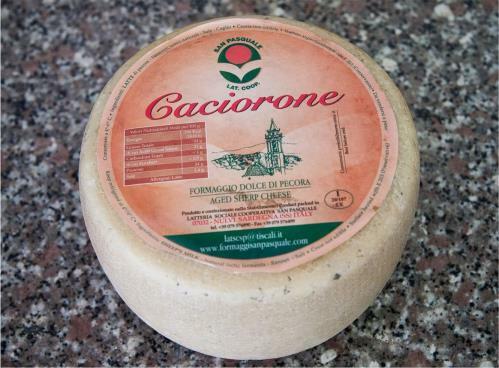 CACIORONE soft table cheese, raw, made from whole sheep's milk, curdled with veal rennet. SHAPE: cylindrical with smooth rind; flat with 19-21 cm diameter, height 11-13 cm. The weight of the shapes varies between 3.8 and 4.5 kg. RIND: young cheeses have a mottled, straw-coloured rind while more seasoned ones have a brown rind. CHEESE: white, tends to age to a light straw colour, soft, compact and with tiny sparse holes, elastic and soft in young forms (30 days), harder as a table cheese with some granularity in the most mature forms (4/6 months). TASTE: sweet and delicate with a pleasant aroma. 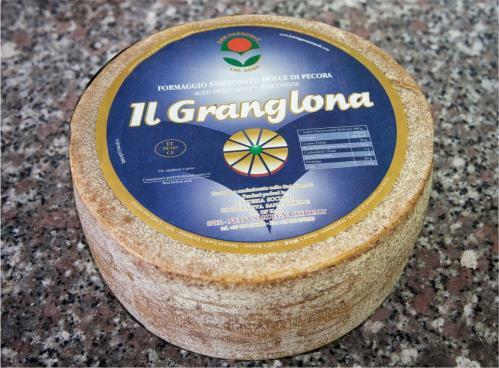 GRANGLONA cooked table cheese, made from sheep's milk, curdled with veal rennet. SHAPE: cylindrical with smooth sides, flat with a diameter of 33-36 cm and a height of 16-20 cm. The weight varies between 16 and 20 kg. RIND: consistent pale yellow straw colour when young (aged at least eighteen months), brown when mature (aged over thirty months). CHEESE: white straw colour with tiny sparse holes. Elastic when young, harder and with some graininess when mature. FLAVOUR: sweet, aromatic and harmonious when young, more intense and pleasantly spicy when mature. AROMA: typical, pleasant and persistent. FAT: not less than 42% of the dry part. 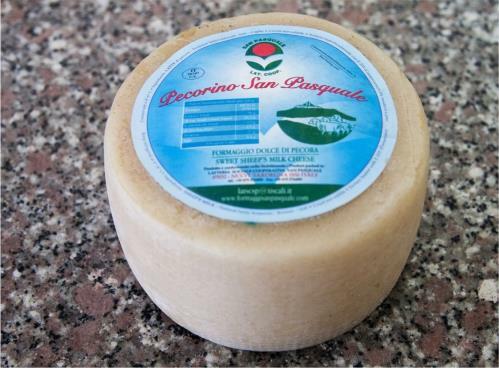 SAN PASQUALE is a semi-cooked cheese for the table or for grating made from whole sheep's milk curdled with liquid veal rennet. SHAPE: cylindrical with smooth rind, flat,16-18 cm diameter, height 9-12 cm. The weight varies between 2 and 2.8 kg. RIND: consistent straw colour when young and brown when more mature. CHEESE: white, tends to age to a light straw colour, compact and with tiny sparse holes, elastic and soft when young (3 months), harder and sometimes slightly grainy when more mature (aged for 10 months or a year). FLAVOUR: sweet and aromatic when young, pleasantly spicy when more mature. 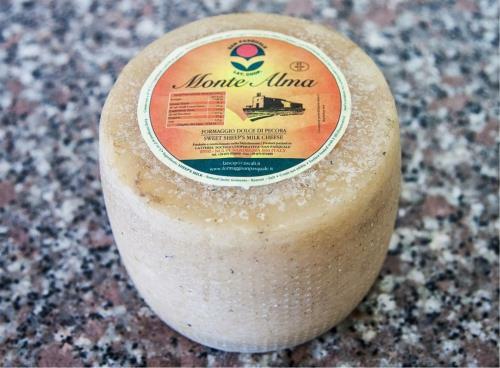 MONTE ALMA is a semi-cooked cheese made from whole sheep's milk curdled with liquid veal rennet. SHAPE: cylindrical with smooth rind, flat,12/14 cm diameter, height 9/12 cm. The weight ranges between 1.3 and 1.7 kg. CHEESE: white, tends to age to a light straw colour, compact with tiny sparse holes, elastic and soft when young (3 months), harder and sometimes slightly grainy when more mature (aged for 10 months or a year). TASTE: aromatic and sweet when young, it becomes pleasantly spicy when aged for more than six months.